Assistant Professor in English - 1 Post for UR category - Basic Pay 37400 Academic Grade Pay 9000 in Pay Band IV - PhD with 8 years experience. 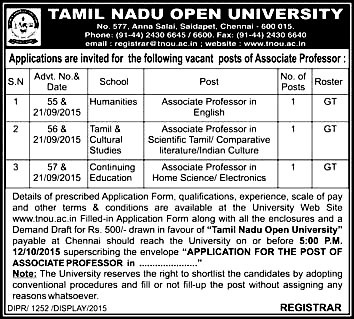 Assistant Professor in Scientific Tamil / Comparative Literature / Indian Culture - 1 Post for UR category - Basic Pay 37400 Academic Grade Pay 9000 in Pay Band IV - PhD with 8 years experience. Assistant Professor in Home Science / Electronics - 1 Post for UR category - Basic Pay 37400 Academic Grade Pay 9000 in Pay Band IV - PhD with 8 years experience.